Jim's Yoga Blahgasana: Yoga - it's not a workout! Yoga - it's not a workout! 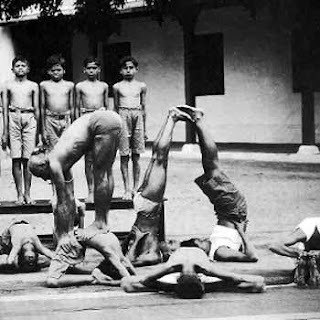 At the Mysore Palace in the early 20th Century, Yoga Master Tirumalai Krishnamacharya was teaching yoga to young men. The yoga he was teaching to these teen and pre-teen boys looks much like calisthenics of today (see picture). Since young pre-pubescent boys are so active and physical (and limber), they took to Krishnamacharya's teaching right away. Many students seemed to master the poses early on. Some students continued to practice these "active" asanas for many years to come. Two of these young boys where BKS Iyengar (Krishnamacharya's brother-in-law) and the late Pattabhi Jois (pictured). Pattabhi Jois passed away in 2009 at the age of 93. Mr. Iyengar (born in 1918) is now 94 years old and still practices several hours of asana a day. Krishnamacharya (born in 1888) lived to 101 years of age. The longevity of these yogis is interesting since the life expectancy of India prior to 1950 was less than 36 years old! The yoga these men practiced in later years changed dramatically from what they practiced as young school boys. Mr. Iyengar is quoted as saying..."When I was young, I played. Now I stay." 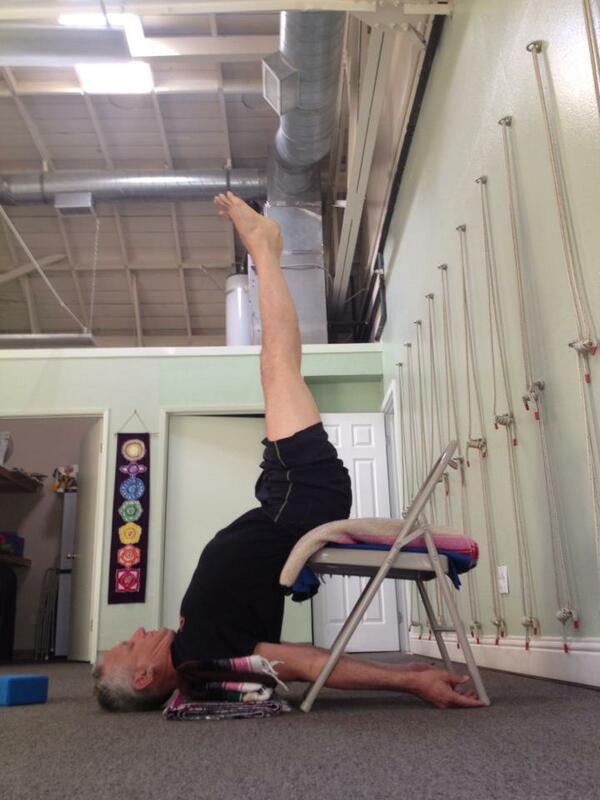 Mr. Iyengar's practiced changed from active movements to long "holding" of poses. In fact, in the Yoga Sutras of Patanjali (approx. 200 BCE) the main sutra on "asana" (2:48) says that the pose should be steady, firm, fixed and happy (Sutra 2:48 - Sthira Sukham Asanam). The next two sutras of Patanjali's Sutras state that "...perfection in asana is not an outward appearance - but rather that perfection occurs when the effort to do the pose becomes effortless and the infinite being within (the atman) is recognized. Then, once that is accomplished, the practitioner no longer will suffer from duality." Thus, asana is "work in" not a "work out" - a meditation on the infinite being within. This is why I hold the pose in my practice. . The use of props enables me to hold the pose longer - and to give "life" to the prop (the chair, the block, the belt, bolster, blanket). I'm not interested in "getting a sweat", in "working out"... in getting "tight abs" - but all those things happen (except the sweat). I am stronger, firmer, more flexible than I've been in 40 years. But that's not why I do the practice. I do it for my mind - and to explore the deepest depths of my being, my soul. I practice yoga to discover the atman within. My yoga is a "work in".... - a work in progress! Jim, the blog name is superb. Effortless effort, while doing asana.